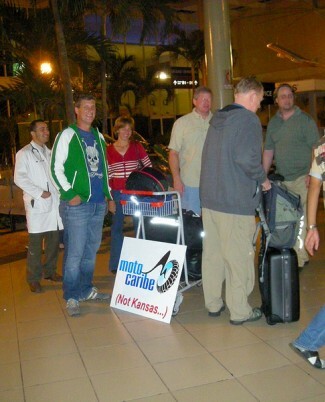 Over the years many MotoCaribe adventurers return home with gigs of pictures, videos and memories and tell the world about their experiences on social media & forums. No matter how we describe our tours, there is no substitute for the experiences our guests can relate in their own words and pictures. 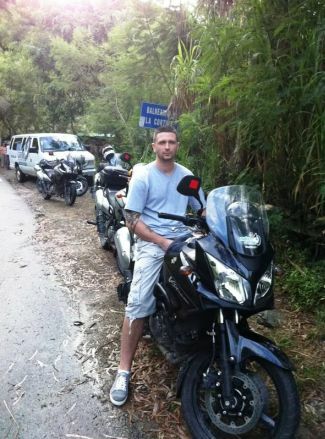 I can honestly say that I never expected to ride motorcycles in the Caribbean, and I can honestly say that I never gave the small island nation of the Dominican Republic a second thought, I mean, doesn’t is share a border with Haiti? But motorcycling is all about getting past our out biases, right. Haiti and the Dominican Republic share the island of Hispaniola, and while Haiti is best known to us Americans because of violent military rule in the early 1990’s and the subsequent intervention of more than 20,000 American troops, the Dominican Republic seems to have put most of its violent uprisings into its history books enjoying a stable and peaceful democracy since the ousting of their last lunatic dictator in 1961. 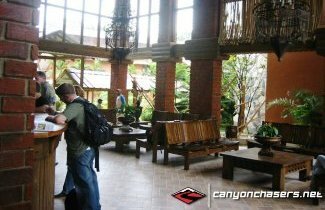 In 2009 when we first visited the Dominican Republic with MotoCaribe, we tried to get our fellow CanyonChasers to join us. Despite our pleadings none felt comfortable enough with the unknown to take the chance. Upon our return and the many stories we came home with managed changed everyone’s mind. So when we were offered a discounted group rate, within 15 minutes of being announced to the gang, all ten bikes spoken for. 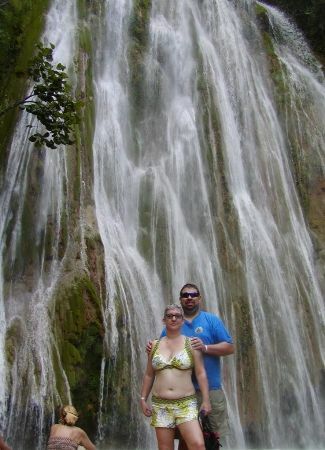 Because of our pro-activity and some luck, our route’s to the Dominican Republic ended up taking us all over the country before we all arrived together again in the Caribbean. I left PDX (that’s Portland Oregon for you non locals) on Saturday May 4th and flew down to Phoenix for a plane change. While in the Phoenix airport late in the evening I got hassled by TSA while wandering around stretching my legs. While putting all my possessions back together I promptly lost my cell. #$@&%*!!! I discovered it was missing about 1 minute before boarding for New York. 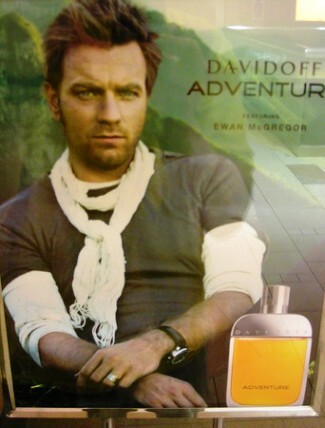 I ran into Ewan there in Phoenix. He was looking for his next adventure also. He wasn’t that talkative and was more interested in selling perfume. If it smells like motorcycles, smoke, dirt, etc. I will buy some and maybe even drink it. Before Christmas he let me know that a ‘Virgin Tour’ was in the works and I should think about coming down there again. So I got permission from the Mrs. and from my employer and I was on my way. Third a little about my riding buddy: A hobo I know that has been in semi-retirement for a while and when I mentioned that I was going he sounded a little put out so I told him if he had any money he should not miss this. So it was me and (Mark) Berserker1 again. I put him on notice that he was not going to be angry and there would be no whining, and if he wasn’t careful he was gonna have a blast. Come to find out his woman told him the same thing. The pillion and I had a great time on this tour, so we want share some photos and comments about the tour. 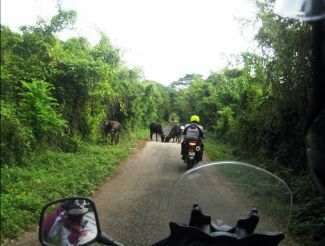 It was an awesome adventure exploring new lands and a new culture in only the way you can do on a motorcycle. We highly recommend it and are already plotting a way to get back again next year. Fantastic! That sums it up, but I’ll give details. Before going on our tour of the north coast with Motocaribe, I’d looked for reviews on here and hadn’t found any, so I guess I’m the first. 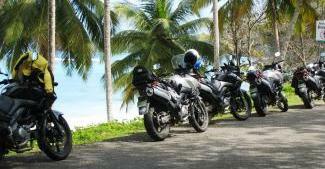 This is a tour, on motorcycles, of the moutainous area (centered in Jarabacoa) and also the Samana Peninsula. 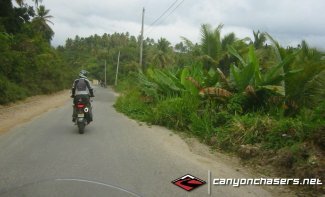 The Motocaribe website (www.motocaribe.com) has tons of details and other trip reports with tons of pictures about what you do each day. Excellent reviews! My main question before going on this trip was if it was too good to be true. but it was ALSO TRUE! We just arrived home yesterday. Robert asked if we had one word to describe this trip what would it be? We sat for awhile in a silent van as all of us tried to find the word that would sum it up. After having more time to think about it I have found the word that works for me. If you are on the fence about doing a tour then get off of it and go. This is not for the meek weekend rider. You will need to be comfortable with riding a bike for extended periods and never knowing what may be around the next corner. (There are very few straight roads in the DR.) It can be anything from a moto, to an overloaded truck, to a stray animal, to the road turning to dirt, a missing manhole cover, and list can go on and on. Life in the DR happens on the road. When you pass homes it is not uncommon to see the entire family and their pets sitting in front of the house with their feet on the road. With stands pedaling anything you may want or never knew you needed you have to be prepared that a vehicle in front of you will stop in the road to make a deal with the proprietor. In the USA you would have a melt down if this happened but in the DR you just give a couple toots of the horn and go around. I’m not used to riding in large groups, and am generally not a fan of even group rides with more than 2 or 3 people in them, and sort of really like to ‘pick my own destination, on the fly,’ so to speak, even though some of the choices may be preceded by a whole lot of research on my behalf in some cases. 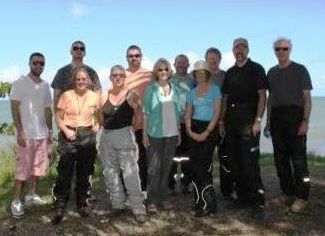 Planned or group trips also seem to be less introspective, and just, well, different. While I expect to do many more solo trips in the future, though, this was really a good trip. I know there was no way that I could have come up with the collection of places, routes and sights that MotoCaribe did, let alone lodging, and it was sort of nice to be able to travel without tools and emergency gear with me for a change. Would I do it again? Yeah, most definitely. MotoCaribe is apparently in the planning stages of offering a ‘desert tour,’ covering the other parts of DR in the future, and that seems like a likely candidate, assuming I can get off work. Very few to no regrets on this trip, and would ride with them again any time! I was browsing the net for tours that would take me to several different destinations so I could explore as much as possible. I couldn’t really find much info on tours that would take me around the island. I have been following DR1 for almost a year now and I came across a company called MotoCaribe. 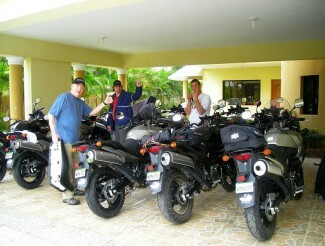 MotoCaribe was the only company that was providing tours through the island and that’s exactly what I was looking for. 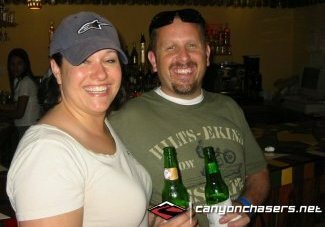 I went to their website www.MotoCaribe.com and started reading some of the reviews. 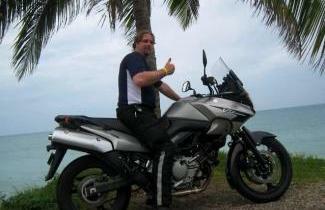 I am not a biker but I had a sports bike a few years ago and decided to contact Robert Cooper from MotoCaribe to get further information about the Tours. Once I contacted him, I found out that I didn’t meet the requirements such as taking the Motorcycle Safety Course. 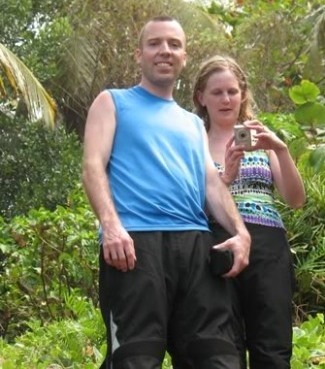 Robert mentioned to me that MotoCaribe provides Van Tours as well. I didn’t waste much time and told him to sign me up for the next tour ASAP. 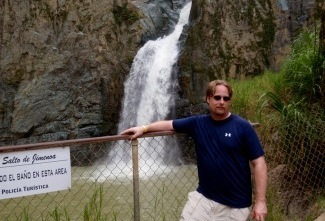 Robert told me that there was a Tour on 11/13/11. Immediately I sent Robert the payment and one week later I was on my way to the DR. On 11/11/11 I landed in Santo Domingo. I spend the first 2 days of my trip at the Capitol and on Sunday morning I made my way to Jarabacoa where MotoCaribe is located. We arrived at a hotel called Gran Jimenoa. The place was absolutely amazing. I must admit that these were the best 5 days of my life. I made some great freinds and saw one of the most beautiful places on the planet. I would have never imagined that the tour would be this AMAZING.